The study of health disparities has emerged as an important theme in public health and the social sciences, and efforts to eliminate health disparities are a major thrust of governments and nongovernmental organizations in the US and abroad. Initially, much work focused on identifying disparities with less emphasis on the contexts that create these disparities. An important shift over the past two decades has been the recognition that health disparities have their roots in social and economic inequalities. Biocultural anthropologists have been addressing issues of health inequities for decades in multiple environments and ethnographic contexts and have increasingly expanded their approaches to more directly focus on the important relationships between inequalities and health in global contexts. These more critical biocultural approaches to health have much to offer studies of health disparities by exploring the contexts of inequality and the embodied processes linking inequalities to biology and health in global-local contexts, demonstrating how large-scale forces and local-level lived realities ‘get under the skin.’ The papers collected here make theoretical, methodological and applied contributions, employing biocultural approaches to address inequalities and health disparities in a range of cultural contexts and, by exploring multiple dimensions of poverty and inequality, of food insecurity, health transitions, and the growing problems of global obesity and diabetes. 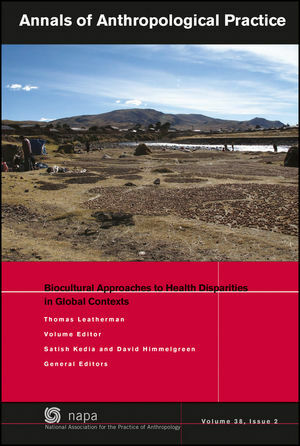 Thomas Leatherman and David Himmelgreen are the authors of Biocultural Approaches to Health Disparities in Global Contexts, published by Wiley.